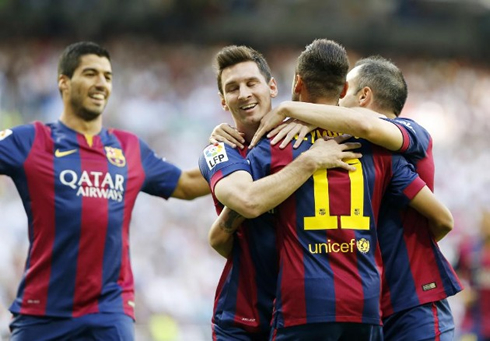 ﻿ Real Madrid 3-1 Barcelona. A comeback victory with a special taste! 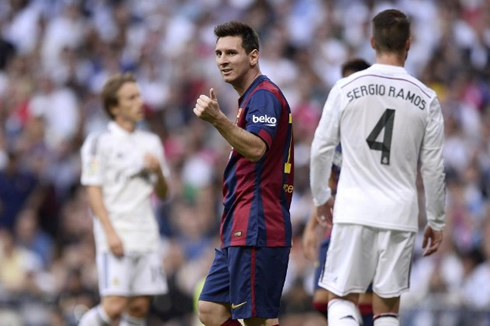 25.10.2014 » Real Madrid 3-1 Barcelona. A comeback victory with a special taste! 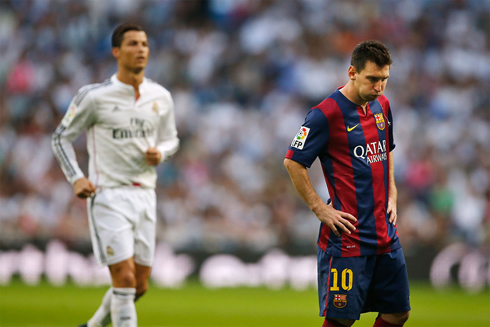 Today's Clasico certainly didn't disappoint even the hardest football fans to please. In what was an electrifying game, Real Madrid came out on top of Barcelona at the end, pulling off a clearly well deserved 3-1 win. Neymar scored first for the visitors, but Cristiano Ronaldo would ignite the "remontada" by netting the equalizer, just to also be followed by goals delivered by Pepe and Benzema. After having lost their two league fixtures against Barcelona last season, this time around Real Madrid have finally beaten their archrivals in a La Liga game, as they dictated their own terms at the Bernabéu in a 3-1 win. Nevertheless, the Blaugrana basically started the game leading it, thanks to a goal scored from Neymar near the 3rd minute of the first half. 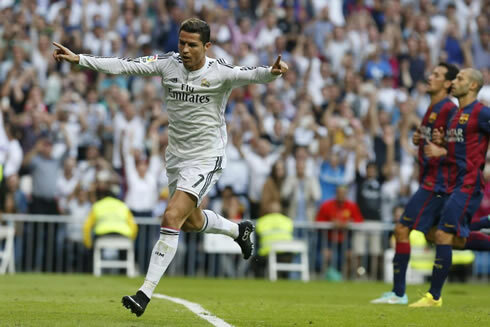 The Merengues' comeback started getting shape when Cristiano Ronaldo equalized the "Clasico" with a penalty-kick near the 35th minute, but the final blows ended up only being struck during the second-half, first through a header from Pepe and lastly a clinical right-foot finish from Karim Benzema. Barcelona will remain on the top of La Liga standings for now, but after tonight's loss, they've already seen Real Madrid cutting distances to a single point. With the two teams coming into this game with all guns blazing, it ended up being Barcelona delivering the first punch in the stomach. The opening goal in this Clasico was the result of a good understanding between the debutant Luis Suárez and the Brazilian ace Neymar Jr, with the first sending the ball over to his teammate from one side of the pitch to the other, ultimately allowing Neymar to take on both Carvajal and Pepe as he was cutting inside from the left. Neither of them managed to stop the 22-year old and he went all the way to finish off his brilliant play with a low strike into the far post, making it 0-1 for the visitors. The 2-1 arrived just a few minutes after the two teams had come from the break. Toni Kroos took a corner-kick on the right attacking side and Pepe rose in the air to beat Claudio Bravo for the second time on the afternoon. The Chilean goalkeeper had never been beaten in La Liga this season, but he was now realizing that facing Real Madrid was a totally different matter. Pepe scored his first goal of the campaign and naturally celebrated it enthusiastically with the home fans. Only ten minutes later and around the 61st minute of the game, Real Madrid added a third to their score and basically sealed the deal at the Bernabéu. It all started in a ball that was about to go out near the sideline on the halfway line, but which ended up leading to a misunderstanding between Iniesta and Mascherano, allowing for Isco to get it back and immediately initiate the counter-attack. The Spaniard left it over to Ronaldo in the middle, who then passed it to his right to James Rodríguez. The Colombia international spotted Benzema making a run a few meters in front of him and assisted him for an irreproachable finish from the Frenchman. 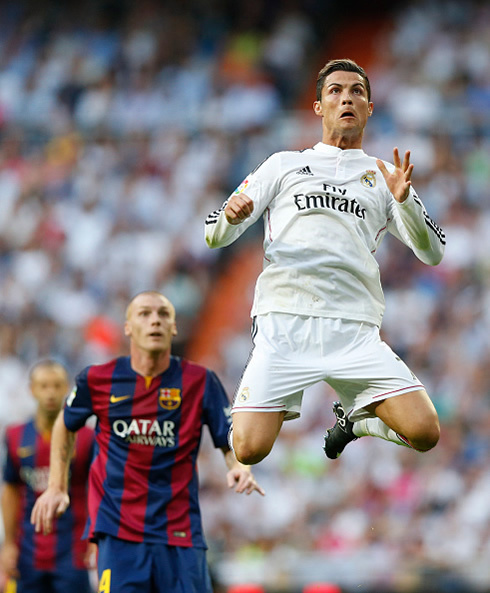 Great football display at the Santiago Bernabéu and 3-1 for the home side! With close to 30 minutes left on the clock left to be played, Real Madrid got more loose in the game and still created a few more chances to extend the lead. The 3-1 score wouldn't suffer any further changes though and every home fan at the Bernabéu was certainly delighted to see their team beating Barça and doing so in such a convincing manner. Cristiano Ronaldo next game for Real Madrid is a Copa del Rey fixture against UE Cornellà, on October 29 (Wednesday). You can watch Juventus live stream, Cornellà vs Real Madrid, Sevilla vs Villarreal, Man Utd vs Chelsea, Tottenham vs Newcastle, and Borussia Monchengladbach vs Bayern Munich, all matches provided from our football streams section.